You know the problem: Your climbing walls look great and welcome a growing number of climbers. Clean holds are not just important for the visual impression of your walls – a perfect grip of the holds also has a big positive impact on your image. To maintain this positive impression and quality on a continuing basis, a periodical cleaning of the holds is required. But how can this be done economically and efficiently? Cleaning the holds using intens leaches, high-pressure water jets or dishwashers is definitely not an ideal solution. The better alternative is our fast, efficient and economical ultrasonic/turbulent flow KGR cleaning system, which we developed especially for cleaning climbing holds. After extensive tests with different hold materials regarding the ideal calibration and matching of frequency, amplitude, cleaning liquid, interval and temperature we can offer a solution, helping you to clean your holds in a cost- and time efficient way. The System ist based on a combined Ultrasonic/Turbulent Flow technology. Schmitt Ultraschalltechnik offers two systems with a volume of 20 Liter and 65 Liter. 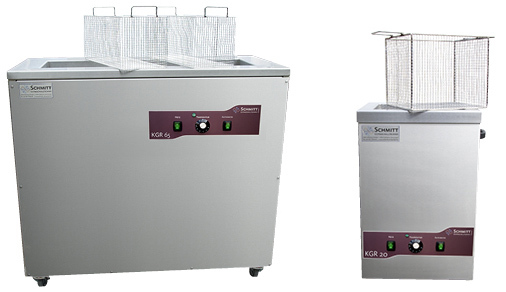 The KGR 65 comes with two baskets to achieve a very fast cleaning. The Dual technology utilises ultrasound cleaning + turbulent flow in a 1-minute interval and removes even most persistant dirt particles (Skin abrasion, shoe abrasion, Magnesium etc.) from the holds. The average cleaning time is approx. 10-15 minutes. The system is designed to clean multiple holds simultaneously. The holds are placed into a metal basket which is hooked into the system. The combined Ultrasonic/Turbulent Flow system is controlled by an electronic interval program: the ultrasonic sequence loosens the dirt particles; the Turbulent Flow sequence dissolves the particles and washes them off. Depending on the degree of pollution, the required cleaning takes just a few minutes. After cleaning, the holds solely need to be shortly flushed with clean water.